Last night we had eleven pilgrims in the albergue and within that, seven nationalities: two Canadians, a Brit, an Italian, one young man from France, a Brazilian, one from Holland and some Spaniards. Despite the fact that last night's albergue experience was pretty good with a great communal meal and surprisingly little snoring, I am still glad that we are booked into a Casa Rural tonight in Monreal. It is our first B&B experience on Spain and so far so good. We have a lovely large private comfortable room with all the amenities; big fluffy towels, a hair dryer, heaters and demi- pensionne or here in Spain media-pensión. Today we walked anywhere from 25-29kms depending on which guidebook to tourist information one goes by. At the end of the day I always congratulate myself on walking whatever the highest mileage was, and yes by mileage I am referring to kilometres. Dayton said he had a tough day today. We started out with over a half hour going through tall wet grass and so, despite waterproof Gortex lined boots, our feet were wet for the rest of the day. 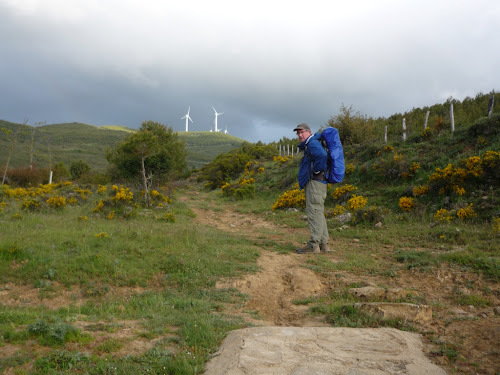 It was cold and windy all day and Dayton said he was just leg-weary and a little disappointed that where we expected to find a restaurant for a lunch break we didn't. Half the afternoon we played hop scotch through the mud but I just kept telling myself to be grateful that it wasn't raining and I was. On top of this, Dayton's boots are literally coming apart at the seams. When we got to Monreal we did find a bar open and by bar the Spanish mean a cafe/restaurant/bar. We are not bar hopping per se just looking for a bocadilla and a tea. Our media-pensión meal was pretty amazing tonight: hearts of romaine with crispy fried garlic salad, a hearty soup and then Dayton had stuffed calamari and I had a fried tofu with sautéed vegetables entree. Very nice. 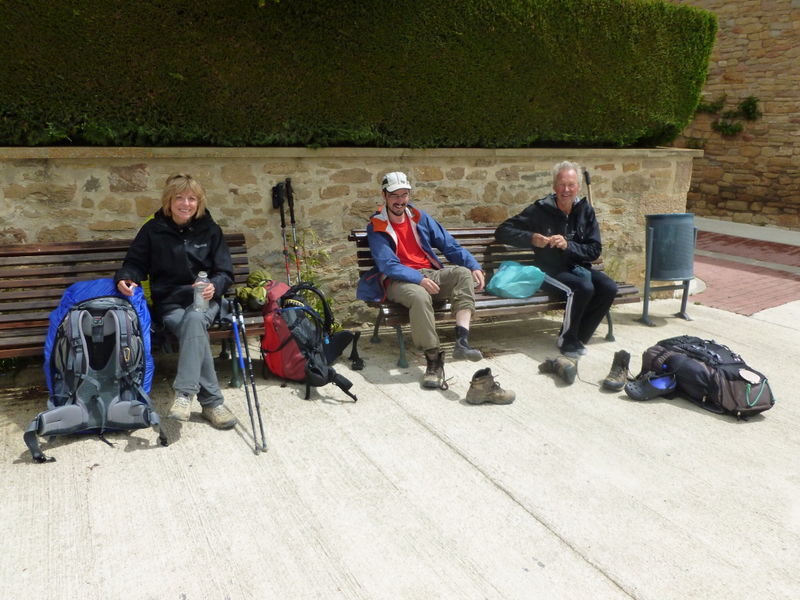 Tomorrow is our last day on this Arles/Aragones route so we have said farewell to our other pilgrim cohorts. After 35 days of walking we will try to make our way by bus or train to Santiago and then the plan is to walk the Muxia route. We will see.